Major spoilers ahead if you haven't watched tonight's episode of Arrow, titled "Broken Arrow"! Tonight's episode of Arrow packed multiple punches, putting more than one character in harm's way, including Felicity, Ray, Roy and Thea. While Thea's life was left hanging by a thread in the final moments of the episode, it's actually Roy who's making his departure from the show... more or less. Colton Haynes is no longer a series regular, but we haven't entirely seen the last of him. 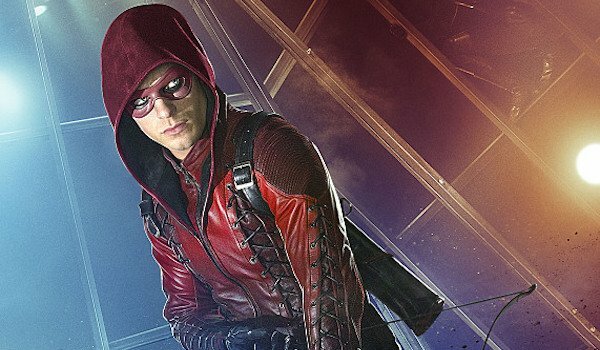 Deadline reports that Colton Haynes' run as a series regular on Arrow has come to an end, however the actor is set to return for one more episode before the end of this season, which is down to its last handful of installments. The site goes on to note that "talks are underway" for Colton Haynes to revisit the Arrow-Flash universe, with possible appearances on Arrow's spinoff The Flash, or the planned Arrow-Flash spinoff. Roy's exit came in the form of a faked death in prison, where he was locked up for taking the blame for Green Arrow's actions. The episode showed Roy getting stabbed in prison, after which Oliver is told that he died. We weren't brought in on the plan for Roy's escape from prison until it was revealed to Oliver that he was indeed alive and mostly well -- coming off what was actually a relatively minor stab wound -- and prepared to leave Starling City, in order to protect Oliver and his secret identity. From what executive producer Greg Berlanti told Deadline, it sounds like it was always the plan for Roy to stick around for two seasons. Haynes left Teen Wolf not long before he took the role of Roy Harper, who went on to become the red-hooded Arsenal, and love interest to Oliver's sister Thea. The hope is that he’ll continue to be part of the universe we are building. We love working with him so much. We’ve talked to him about returning to one of the three shows, and if available, he has expressed interest. He is gone but definitely not forever. As for how Roy's departure will impact Team Arrow, I'm sure they'll miss having his strength and bravery on hand. But I'm more curious about the timing of the character's departure along with how things ended with Thea in this week's episode. Assuming she survives (or revives), Roy's absence may give the writers more flexibility to change Thea in some major way without having to find ways to factor Roy into the equation. Romance does tend to complicate these things. All we can do is speculate, and obsess over the trailer for next week's "The Fallen." "Broken Arrow" was the first of the final five episodes of Arrow's third season. The CW is being merciful with us going forward, and it doesn't look like there will be any more gaps between now and and the Season 3 finale on May 13.